Uttar Pradesh Subordinate Service Selection Commission (UPSSSC) had organized exam for Revenue Inspector (Rajaswa Nirikshak) / Kanoongo on 17 July 2016. It was held for finding eligible candidates for 465 posts for which applications were invited from 02-05-2016 to 23-05-2016. Selected candidates are to be posted on pay scale of 5200-20200 GP 2800. The test was held at various centres in Uttar Pradesh. Now the result of UP Rajaswa Nirikshak exam had been declared. Here you can check UPSSSC Revenue Inspector Exam result as it gets declared. UPSSSC had announced the result of Revenue Inspector Exam on 03.10.2016. You can check it from below link. 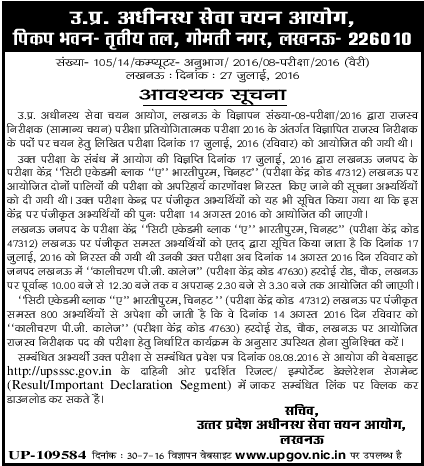 Uttar Pradesh Subordinate Service Selection Commission will organize written exam for Revenue Inspector posts on 17.07.2016. For that, result are prepared now and as they got prepared, they will be declared by UPSSSC via its website. We will keep you updated with the result time to time. Candidates can know UPSSSC result for Revenue Inspector from this page with all the latest news. Here are the expected cut off marks for UP Revenue Inspector (Kanoongo). There were two papers of objective type in the revenue insp. exam with 02:30 hours time for Paper-I and 1 hours for Paper-II. There was no negative marking. Those who qualify the written test have to go through interview which is of 50 marks.